Well, Orange County Registrar of Voters Neal Kelly is as good as his word. He managed to get the count completed before the deadline of December 2nd. A pre-Thanksgiving check of the results show that no ballots remain to be counted. We assumed this was the case when we received the most recent announcement of the City Council agenda for the meeting on December 2nd - it showed that early in the schedule there will be new council members seated and a new Mayor and Mayor Pro Tempore will be elected. We assume the election will be certified before that date. I don't know how Kelly feels about finishing this task before Thanksgiving, but I suspect he's been thinking a lot about "turkeys" these past few weeks. 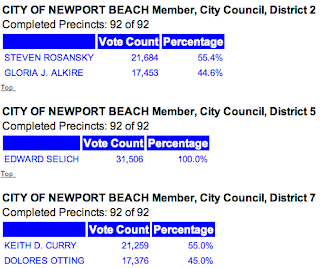 The following are the results from races of interest here in the land of Newport-Mesa. Not much changed since the early ballot counting. 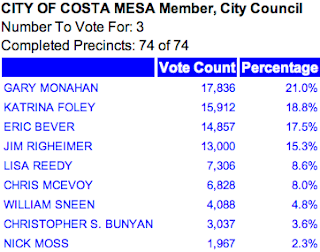 In the case of Costa Mesa, re-tread Gary Monahan led the field with nearly 18,000 votes - he finished 1,924 votes ahead of Katrina Foley, who garnered almost 16,000 votes. Foley finished 1,055 votes ahead of Eric Bever, who ended up with slightly fewer than 15,000 votes. 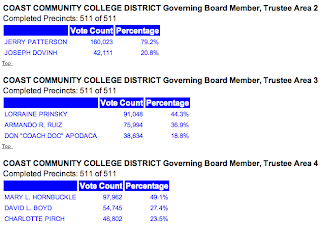 Bever finished 1,857 votes ahead of the OC GOP's fair-haired boy, Jim Righeimer. I don't know if it's significant - or if Riggy should read something into it - but he finished with an even 13,000 votes. Guess this has not been a lucky year for Riggy. Lisa Reedy finished with just over 7,300 votes and Chris McEvoy received 6,828, even though both ran very thin campaigns. 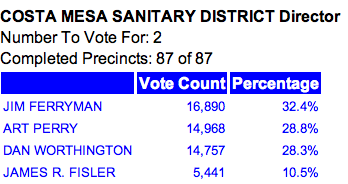 Bill Sneen ended up with just over 4,000 votes and Chris Bunyan was slightly more than 1,000 votes behind Sneen. Youngster Nick Moss finished with fewer than 2,000 votes. I'll let you do the analysis of the remaining races. As you can see, the incumbents - Ferryman and Perry - held onto their seats, so to speak. Border guardian Dan Worthington came up a couple hundred votes short and Jim (I'm a Realtor here in town) Fisler finished a very distant fourth and last.